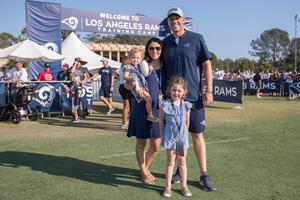 La Salle graduate Shane Waldron '97 will be part of Super Bowl LIII in Atlanta on Sunday as the Los Angeles Rams face the New England Patriots. Waldron is the passing-game coordinator for the Rams. Waldron, 39, has worked in the National Football League for several years. He started his career as an intern with the New England Patriots, then worked for the University of Notre Dame, the Patriots, the United Football League's Hartford Colonials, the University of Massachusetts, and Washington's NFL team. He joined the Rams' coaching staff in 2017. In addition to playing for La Salle, Waldron played tight end and long snapper at Tufts University, where he studied economics before graduating in 2002. Ray Baker, who was La Salle's head football coach during Waldron's high school years, said he was proud of Waldron. Rams coach Sean McVay similarly praised Waldron last fall, according to The Detroit News. "He's a phenomenal coach," McVay said during a conference call with reporters. "He's a great communicator. He’s got a rare ability to authentically and genuinely connect with not only coaches but the players and be able to correct in a manner that doesn’t make guys' guards come up. It's all about problem-solving and doing it together." Waldron isn’t the only Lasallian to make to the NFL. James Whalen' 96 played for the Dallas Cowboys in the early 2000s. Waldron grew up in Carver and attended Carver Grade School, Clackamas Elementary, and Sunrise Junior High before enrolling at La Salle. His parents, Karen and Jay Waldron, are thrilled with their son’s success. 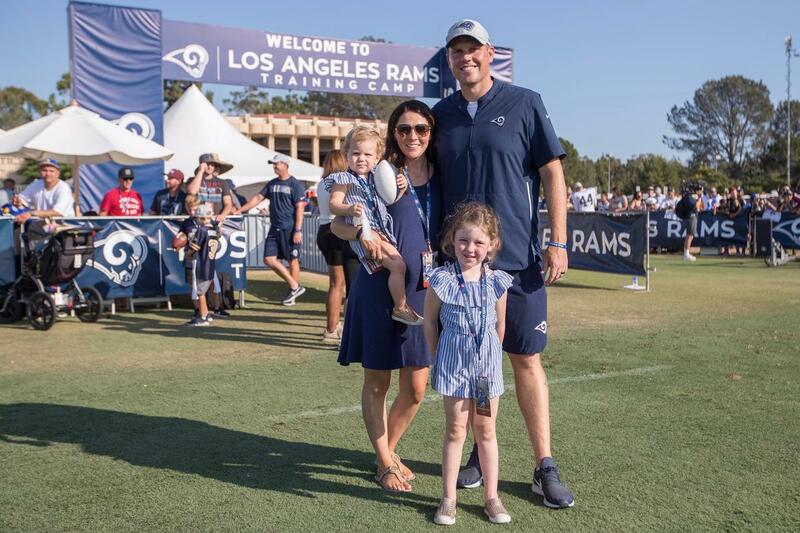 Photo: La Salle grad Shane Waldron '97 poses with his wife Meghan and daughters Rylee and Lainey at the Rams' training camp last August.